Metastatic Breast Cancer - Even Homework Can Cause Tears. Someone once told me, “A picture can tell a thousand words.” I guess they just forgot to mention that those words can change. Not even a few words changed for me; my whole life was rewritten. The three girls in this photograph look so happy and peaceful, one just reading her book, one smiling for the camera, and one who is too in love with apple juice to pull it from her mouth for two seconds. If I did not know these people and saw this picture of these three girls, I would never once even doubt that they did not have a great life. Unfortunately, however, I do know those girls. I am one of those girls. And who I see today is not the young, innocent girl I once was in this photo. It is hard for me to remember exactly what happened that day in that room. One of the only things I remember was when I stepped through those big swinging doors, I was almost excited to be in a hospital, for the only other time I was in one was when I was born, but I obviously do not remember that (thank God). I was not sure why I was brought there but hey, they had free apple juice! The room walls were such a clean white, the smell of medicine was actually a sweet aroma, and I have to admit I played on the mechanical hospital bed that went up and down by a push of a button for quite some time. The hospital bed had the number three on it, and I thought it was so ironic, because it was us three sisters squeezed onto its warm covers. Everything was going fine. If only it stayed that way. Right after this picture was taken, we were told the news. The word “news” makes it sound too casual. This was everything but casual; it was more like being told the catastrophe. At the age of eleven, my only problems were if I lost the game of handball or dropped my bag of goldfish on the floor. So hearing the words from your dad, “Mommy has breast cancer” was so painful, it struck me like a car crash. The words were the car; I was the helpless victim; all in four words, I have never been so hurt. I turned paler than the walls. I could feel my heart crumple like paper. It was difficult to breath. I was distraught by a loud ringing in my ears. I wish I could take those words out of his mouth and simply throw them away like a piece of trash. That is what it was: trash. My mom is the sweetest, most caring person in the world and she has to die? I was sad. I was hurt. I was angry. The worst part is that the pain did not even stop there. This nightmare was not over. I was told three years later, “The cancer spread to her lungs. She only has 10 more years to live.” I have never felt something that is so unexplainable; I cannot even put it into words. It was more than just pain and anger now. It was fear. It was torture. I repeated the words in my head: mommy, cancer, death. The three words played over and over in my mind like a torturous, screeching tune. The devastating news broke me down like a collapsing building in a construction site. However, I was not built into a larger, newly renovated mansion, but was left there alone with scattered pebbles and the smell of dirt and old wood. I will never hate a place as much as I hate the hospital. The bright white walls I thought looked clean became overbearing and only reminded me of a psych ward. I felt trapped and suffocated. The smell of medicine I once enjoyed turned sour and gave me a headache. The motion of the mechanical bed made me feel sick and only reminded me that if you bring something up, there is a possibility it will fall back down. The number three above the bed no longer represented three happy sisters, but soon represented the number of daughters who will not have their mom with them on their wedding day, the three sisters who will not have a grandmother to offer to their children, the three sisters who will have to stay together as they watch their mom move on to Heaven too soon. People always said being in hospitals give a feeling of death, but I got to take that feeling home with me. The heart break and fear did not stop when we walked out those ugly doors, but became my shadow and followed me everywhere. I have cried in front of my friends and my peers. One time I even cried as I was held by one of my teachers (thank you). I cannot escape this. It is not something I can outrun or hide from. This nightmare was not just a bad dream. It was my reality. This little girl in the picture, sipping on her apple juice probably thinking about cute boys that she will see in her class tomorrow, is no longer the same girl today (except for the cute boys part). I cannot relate to that little redhead I see. She never had to live a single day wondering if her mom’s surgery was going to help or do the exact opposite. The only times she ever felt sad was because she did not want to be “it” in a game of tag. Not only can I not relate to this girl, but I am envious of her. I never once knew I could be so jealous of my past self. I bet she never had to fake a smile and a “I’m fine” when someone asked why she looked down. But why would she? She did not know such a criminal like death was going to steal her mom from her. My mom was slipping through my hands like sand. Every second that passes, a grain falls and soon I am left with nothing. 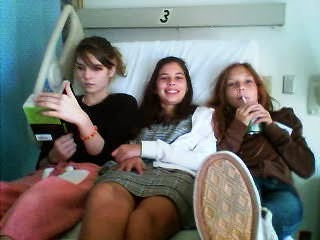 My sisters and I lie so close to each other in the hospital bed. Our arms are tightly pressed together almost like we are blocking something. We are trying to stop my mom’s fate from touching her. We must protect her and help her in this last decade of her life. What once was my comfort and safety is now what I must defend. This situation has definitely brought my family closer though. We used to be like five loose knots on a rope, we were all from the same foundation but were not bound together well, but this has stretched ourselves and our love and pulled our knots back to a secure, firm base. And we will still remain tight, close, and strong, even when one of our five knots will fall. The invitation lower down in this blog is for last year's luncheon. Do not confuse it with Ruby's!! The Orange County (CA) Register was kind enough to write an article about my experience with breast cancer, including the fact that I am metastatic. The main focus is on low income women and their struggles (well, mine) to obtain medical care. I finally found help through the National Breast and Cervical Cancer Treatment Program (BCCTP). If you have breast or cervical cancer, and are "financially challenged", please look to your state's version of this program. Also note, there is a prostate cancer version for the men we love. Somebody just sent me this link, which includes pictures. Please visit again, so you can see who I am. Thanks for all the support. I'm feeling pretty cherished. My upcoming fundraiser to benefit metastatic breast cancer organizations and fighters. If you live in or around Costa Mesa, please feel free to print this and attend our gathering. RSVP at StageIVLife@aol.com. Stage IV metastatic breast cancer is an advanced disease, in which breast cancer spreads beyond the breast and throughout the body. From research and treatments, to individual patient needs, we hope to provide support and care for women (and men) who face life long cancer treatment. You can help, by joining us for a self paid happy hour gathering of fantastic Mexican food. Your family and friends are welcome to join us, until we reach our maximum capacity of 200 guests per gathering. Please invite them. We are looking to fill the place up! Don’t forget to bring your coupons! Each gathering will include a short presentation. We will be accepting donations at the event. Please feel free to donate as personal finances allow. Tax deductible donations can be made to “METAvivor” or “MBCN” (both can be located on the internet). Be sure to make your donation in honor or in memory of someone you care about. If you prefer, you may mail your donation to: c/o Laura Wells. 2671 Club Mesa Pl. Costa Mesa, CA 92627. All donations will be forwarded to your requested organization. 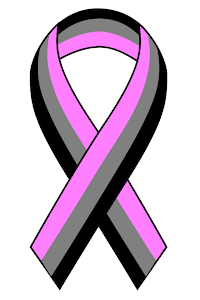 October 13th is National Metastatic Breast Cancer Awareness Day . I wrote this article for occupyhealthcare.net. Please read it. Fairly recently, I posted at forum I visit, when I want to talk about God, and how well I am (or am not) following Him. Basically, I expressed my sorrow over all the things I thought I would do with my life but have not done. Not the fun, life experience things (although I certainly have a list of those), but the really important things I had hoped to do, that would make the world better. When I was a child, I had a dream, where I took an old Goodwill drop off site (that actually existed in the middle of a store parking lot), and built a beautiful, magnificent home out of it. I can't describe it, except to say, it had a lot of glass, and the sun shown it's light into it all day. I can still, vaguely picture it. In my dream, this new home became a place where I invited homeless people to live. Back then, I don't think there were as many homeless people around as there seems to be today, but somehow, I was aware of them. As I grew up, and at times "away", as many young adults do, I still always retained a yearning to give to others. I always wanted to give children love, have lots of my own, as well as foster, and adopt. I always wanted to give my change to anyone outside a store, buy food for the hungry homeless people out on the streets. In my twenties, I lived in a town home style complex, with two rows of apartments. I always though what a great place it could be as a homeless "starter" shelter. One apartment could be an office, one could be a free day care center, and the rest could be filled with men, women, and families, trying to get back on their feet. They could live rent free, while taking job training, or college courses. They could have an address to write down on a job application, so they could find work. Here and there, throughout my life, I did manage to give a little. I sponsored a young girl in Israel who needed surgery, I sent monthly care packages to a very poor family in "the farmlands of America". I sponsored a starving child in South America. I bought the "feed the children" cards at the grocery stores, and for awhile, even became a volunteer card stocker. I volunteered to be a "Big Sister" at a time when Big Sisters weren't in great need. But, I was never able to give "enough", never felt I did my share to really help those in need. And so, I posted all this, through teary eyes. And, one of my loving friends responded in a way that quite surprised me. He said, I was facing end of life issues, and processing my life, as anyone does, while facing death. I hadn't though of that. Of course, I know everyone has regrets, and that they process those regrets when they are facing their death. But, in my limited experience, mostly through movies and other media, this happens very shortly before death. A very elderly person, in a nursing home, perhaps. Or a sick person on their "death bed". Or even, in the "life that flashes before the eyes" of a person who has just been in a severe accident, just before he or she dies. I have always recognized that day would come, when I would face my regrets, but I did innocently, and naively think it would be just before death, and I have lived with the illusion that I might, someday, still be able to act on some of those regrets in the future....someday. What I never could have guessed, was that I would face these regrets at the "tender age" of 45, as my cancer makes me face a death that could be fairly far off, if all goes well with my treatment. I haven't seen 'The Bucket List', but assume all the items on that list, are experiences the characters would regret not having done, before they do, actually die. And, I assume they accomplished, at least, most of them. I, too, have a list. Maybe not quite a bucket list, but things I have always wanted to do but not been able to. Some of those things, I have already written about above. But, there are other things I have always wanted to do, that, until cancer, I could convince myself might still happen...someday. I have several children's books I would like to publish. I would like to visit Hawaii, Japan, Italy - the lands of my heritage. I would like to travel around my own country, these beautiful United States - show my children the Grand Canyon, Old Faithful, Mount Rushmore...collect lightning bugs in a jar. There are things I started, but never finished - a medical career, that I set aside, when I recurred at stage IV, joining and dropping out of the church choir (twice - one per cancer diagnosis), volunteering with my church's children's program, again after recurrence. And, I have new goals, too. Metastatic breast cancer advocacy, writing and publishing books about my cancer experience, my very crooked walk with God, and even how a person's race affects their lives, as they grow up in their area of the U.S. There are those usual growing older experiences with friends and family- weddings, grandchildren, special anniversaries, etc. Some of these, I may still accomplish - but most will remain regrets. And, the difference between my real life and the movie, 'The Bucket List', is that I don't have all the money in the world to run off and fulfill all the adventures on my list. And, the difference between my life, and someone who may have that flash and then recover, is that I can not physically do some of the things on my list. And, the difference between my life and those who face their regrets on their actual death beds, is that I may live with the sorrow of my regrets for a very long time. Life is precious, of course, and I fight for mine, every day. I hope to live for a long, long time. And, I know there will be great joys in the life I live. But, far too soon, I am also aware of, and living with my regrets. I found my first breast cancer lump in January of 2007. That's the day I became a Warrior, with a capital "W". Here are two definitions of Warrior. a person who shows or has shown great vigor, courage, or aggressiveness, as in politics or athletics. I certainly engaged in warfare. I was at war with my own body, and after gathering intel on the enemy, researching the best weapons, and recruiting my army (of doctors and supporters), I charged into battle. I charged into the battle of my life - a battle to save my life. At times, I was filled with fear. Fear of death, certainly, but also fear of the battle itself. How hard would it be to fight, as I became injured, sick, and fatigued. How long could I sustain my courage, while I poisoned my body over and over, had surgery after surgery, and even willingly submitted myself to radiation? How long could I remain aggressive, while I lay sick, recovering from all those poisons- while I lay in pain, recovering from all those surgeries- while I lay asleep, recovering from the fatigue, caused not only by the radiation, but also by the many medicines, which were my weapons? But, again, I was truly a Warrior with a capital "W", and I fought with the goal of conquering the enemy, that cancer that was trying to kill me: stealthy, sneaky. And, I did conquer the enemy. I won the battle. But, as it turned out, I did not win the war. Today, as a woman with metastatic breast cancer, I am now an experienced warrior, but no longer a warrior with a capital "W". I am no longer a soldier on a short term mission to conquer the enemy, but a fatigued fighter, trudging along in enemy territory, fighting not to be conquered myself. I am on the defensive, now. The capital "W" Warrior was on the offensive, seeking out the murderous enemy, aiming to kill it, to drive it away forever. This new warrior, the one that is not capitalized, is on the defensive, aiming to protect myself, my life, though I am now behind enemy lines. For the enemy has made advances. I still have my army, those whom I trust to fight alongside me, until my war is over. My weapons change, as the enemy, cancer, learns how to outsmart them, and even as my own weapons cause their own harm to me, as occasionally, I become a victim of "friendly fire". But, I have many weapons, many ways to keep the enemy at bay, and each time the enemy, cancer moves in, I will find another, different weapon to fend it off for a little longer. This battle is forever, not short term, like the first one. And this battle, will eventually, surely end with my death. One day, the enemy, cancer will win. But, being a warrior, even a defensive warrior, I will not give up. Through triumphs and failures, gains and losses, moments when I am the conqueror and moments when I am the conquered, I will continue to fight. Daily, I will put on my armor, pick up my weapons, gather my army around me, call on my God, and I will fight. And, even though I have lost my capital "W", I will remain a warrior. I will continue to fight. I will play when I have energy. I will sleep when I am fatigued, and I will love always. And, because I will do these things while I can - whether it is for two years or twelve - in the end, even when the enemy, cancer finally wins this final, long fought battle, perhaps, just perhaps, I will have still won the war. Pink - The universal color of breast cancer (and still my favorite color). Gray - the nowhere land where a metastatic patient lives, trying to come to terms with a death that can be near or far, and trying to live (and love) as much as we can within that unknown time frame. Black - the end of our fight, when it might seem like cancer has won, except, if we leave love behind, we are always the winners!